National Comfort Institute is the industry leader in Performance-Based Contracting™. As an NCI Training Partner, you have the opportunity to bring this game-changing training to your customers. Our training programs not only equip HVAC contractors to deliver true efficiency in the equipment they install but will create added value for your company. Improve your image, increase profit and reduce unwanted call backs and warranty claims with our cutting-edge methods. NCI's programs will set you apart from your competition, generate quality leads and create new sales opportunities with every training event. One of NCI's core objectives is to develop and deliver training programs that assist HVAC professionals to build their capabilities, knowledge, and understanding. This allows them to make full use of resources and effectively apply forward-thinking techniques in system efficiency and safety. Benefit from years of vast industry knowledge that our full time staff of expert instuctors can provide your organization. Ongoing training is a constant focus area for all HVAC distributors and other HVAC organizations and has become a powerful tool to improve business performance. Bring NCI training to your facility and take advantage of the benefits our specialized programs bring into your company. Improve Contractor Profitability & Performance and More! Our industry-changing training programs bring measured performance, effective efficiency, and safety to the frontline of your business. NCI is focused on helping contractors develop a Performance-Based culture that will enable them to become more successful in their market. Our hands-on, interactive training sessions provide the best practices and tools necessary to achieve the highest level of quality and performance. We offer your personnel and customers every opportunity for performance-based success through our training, industry resources, and business services. Ask about program availability in your area by calling 800-633-7058. Sponsoring a training event allows you to expose your organization, products, and services to an audience of professionals in your local market. A sponsored class is considered public with a mix of your dealers and local contractors in attendance. In a joint effort, NCI markets the training event to hundreds of contractors in the region. You will also be provided with a kit to successfully market the training event to your customer base. You have the opportunity to network and impress those not familiar with your organization and provide significant discounts to your established contractors to attend the training event. Sponsoring guarantees the training at your location and is a cost-effective option for many companies to bring ongoing training to their facility. A private NCI training event can be customized to your needs and market demand. Since our instructors come to you, your training participants can take full advantage of the interactive, hands-on training session from the comfort of their own work environment. This type of event consists only of your staff and registered attendees. Private NCI events provide you with the deepest discounts on seats and every opportunity for profit, if desired. Its a "win-win" for you the host company and the attendees. NCI will provide you with a kit to successfully market the training event to your customer base and local area. Become an NCI Training Partner today and bring the most cutting-edge training in the industry right to your doorstep. For more information about how to become an NCI Training Partner, call NCI Customer Service at 800-633-7058. 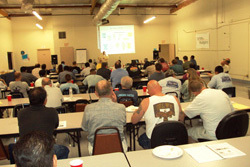 "We have seen dramatic increases in both counter traffic sales and response to bids after hosting NCI training classes! Partnering with NCI improves our image in the eyes of the technician and the owner of businesses dedicated to providing the very best services to the end user."